The 1 million-square-foot plant will be built in a planned industrial park in Coolidge, about 50 miles south of Phoenix. Nikola expects to break ground in 2020 and begin building vehicles for fleet tests there in 2021 with full commercial production by 2023, Trevor Milton, the company’s founder and chief executive told Trucks.com. 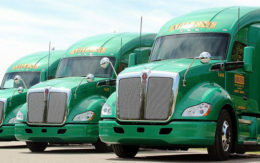 At full capacity, the billion-dollar plant will be able to churn out 50,000 trucks a year, although initial plans are for 35,000 a year, Milton said. The privately held company declined to disclose the price it paid for the land, but the Phoenix Business Journal, quoting a broker involved in the transaction, pegged it at $23.085 million. Nikola raised about $300 million in capital has non-binding advance orders for about 14,000 of its Class 8 day- and sleeper-cab trucks, according to Milton. While most will use hydrogen fuel cell powertrains, Milton said the company also will build battery-electric models for customers who don’t need the longer-distance capabilities possible with fuel-cell trucks. Nikola also has solar power and sports divisions and is building a battery-electric all-terrain vehicle, the Nikola NZT, and possibly an electric personal watercraft. To support its fuel cell trucks, which need compressed hydrogen fuel, Nikola also intends to become a hydrogen fueling station developer, in conjunction with Norwegian hydrogen station developer Nel ASA. Nikola’s plans call for more than 700 hydrogen stations around the world. The price of Nikola trucks – most of them likely to be leased – will include fueling at those stations. As part of the factory land deal, which is supported in part by future state and local tax breaks, Nikola said it will bring about 2,000 jobs to the region. A second electric vehicle maker, Lucid Motors, is planning a car manufacturing facility on about 500 acres in the same Arizona county. That deal is a lease-purchase arrangement, according to the Phoenix Business Journal. While Nikola selected the rural Coolidge area for its plant, the company is completing a $75-million headquarters and design, research and development center in Phoenix. Nikola was started by Milton in Utah in 2012 and relocated to Arizona last year. The company plans to show off its products and plans in Phoenix next month at a “Nikola World” event that Milton said will be the first of an ongoing series of technology show cases. I hear there is something going on in the Phoenix area April 20th where you can see this product. Is it possible to attend?